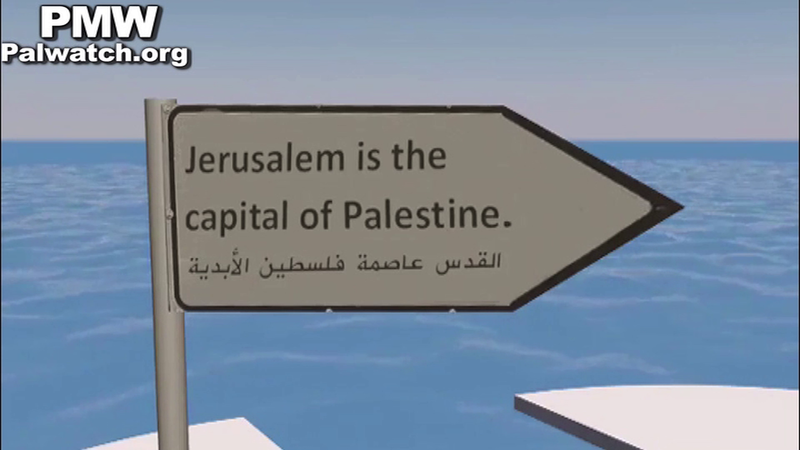 because "Jerusalem is the capital of Palestine"
what ever you claim Mr. #Trump !!" Posted text: "#Jerusalem. is an Arabic & Islamic city, what ever you claim Mr. #Trump !!" The video shows Netanyahu and Trump floating on a raft at sea with Israeli and American flags and a sign saying "US Embassy" in Hebrew, Arabic, and English. Trump is holding a piece of paper on which is written "Jerusalem capital of Israel," while a recording of his statement "and Jerusalem is Israel's capital" is heard. Immediately after his declaration the raft breaks in two, and Trump drowns together with the Israeli flag; Netanyahu jumps into the water and disappears. 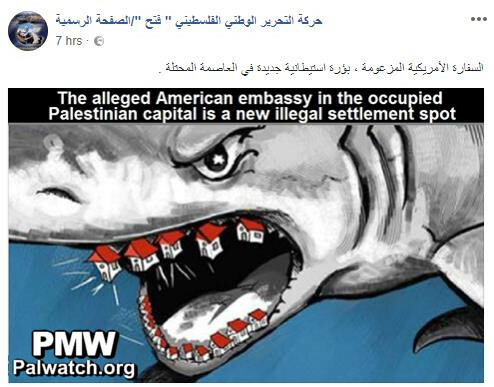 The embassy sign flips, and the reverse side of it reads: "Jerusalem is the capital of Palestine." A ship flying the UN flag and the flags of a number of countries including Ireland, Turkey, Lebanon, and other Arab states then pulls up to stop by the raft. 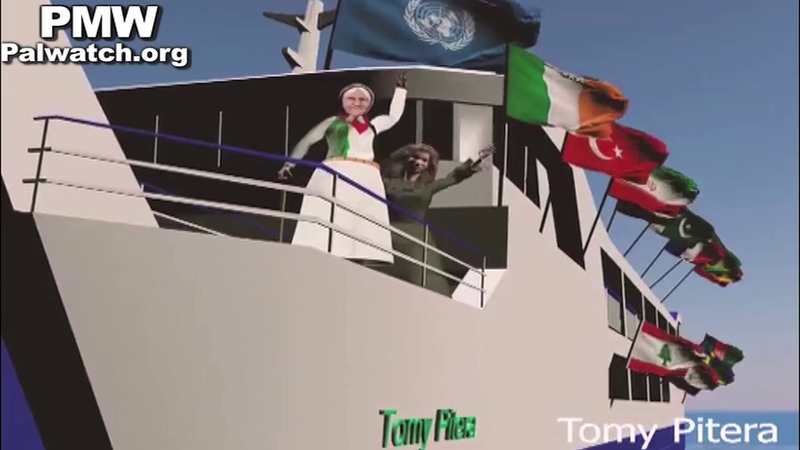 On the ship an elderly woman wearing a Palestinian flag and a younger woman dressed in black are waving. 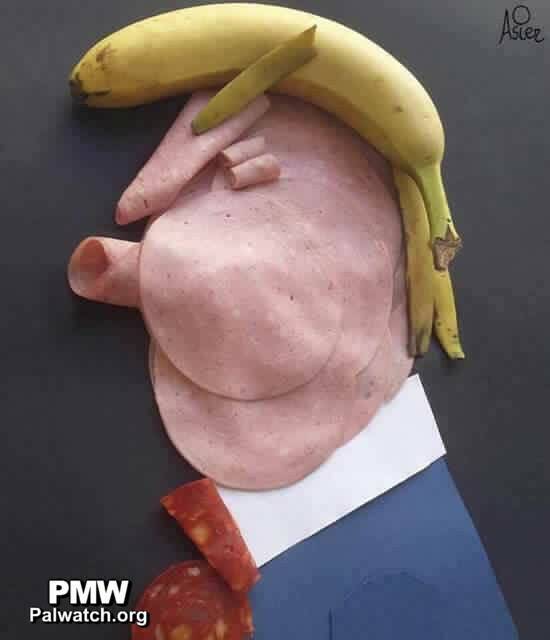 PA and Fatah leaders have mocked Trump before, as Palestinian Media Watch has reported, calling him a "rich adolescent," an "ignoramus," and "the crazy man." 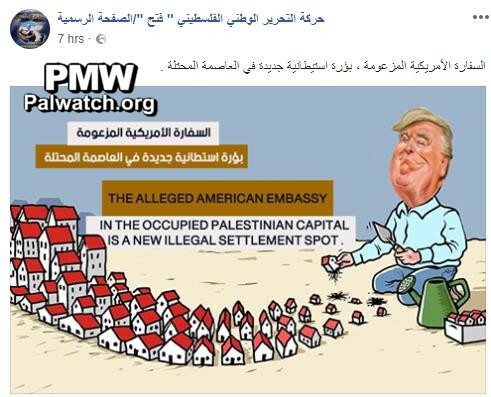 Text on images in Arabic and English: "The alleged American embassy in the occupied Palestinian capital is a new illegal settlement spot"
Posted text: "The alleged American embassy is a new outpost in the occupied capital"
The cartoon shows Trump planting rows of houses with red roofs, characteristic of Israeli towns in the West Bank. Trump is holding a spade and has a watering can and a box with more houses in it next to him. 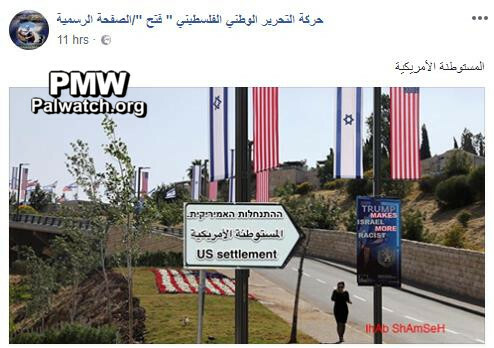 A photoshopped picture of American and Israeli flags and a sign pointing to the new American embassy in Jerusalem changed the sign's original text "US embassy" to "US settlement," and a poster with the text "Trump Make Israel Great" was replaced with "Trump makes Israel more racist." 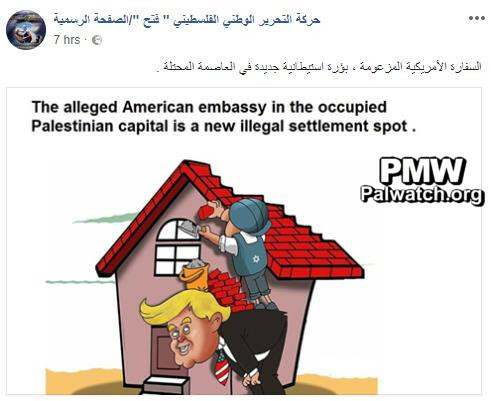 Posted text: "The American settlement"
Text on the sign in Hebrew, Arabic, and English: "US Embassy"
Text on the poster in English: "Trump Make Israel Great"
The animated video of Trump drowning was posted by Abbas' Fatah Movement on Facebook on the day the US embassy opened in Jerusalem. On Dec. 6, 2017, US President Donald Trump formally recognized Jerusalem as Israel's capital. 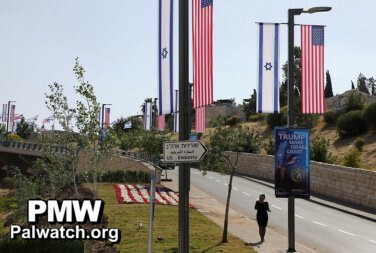 The US embassy opened in Jerusalem on May 14, 2018, the anniversary of Israel's declaration of independence in 1948 according to the Gregorian calendar. The young woman seen at the end of the animated video is meant to represent Ahed Tamimi a teenage female Palestinian who attacked Israeli soldiers on Dec. 15, 2017, near the village of Nabi Saleh, north of Ramallah, together with her 21-year-old female cousin, Nour Tamimi, and her mother, Nariman. Ahed was later arrested and charged with several counts, including aggravated assault, hindering a soldier in the line of duty, incitement, and rock throwing. After her arrest, PA Chairman Mahmoud Abbas called her father Bassem Tamimi to praise her and her family's participation in "peaceful" protests. Ahed Tamimi has a history of assaulting Israeli soldiers.